Its still August, but we are ready to roll out our Fall Pricing Specials for the Lube Division. We're pleased to offer Citgo Citgard 700 Synthetic Blend 15w40 Diesel Engine Oil in 4-1 Gallon Cases. We're also offering deals on Valvtect, Diesel Fuel Supplement, Two Cycle Oil, SAE 30, SAE 40, and Oil Eater Products. Dont forget - until September rolls on in, you can still save 5% off your entire Bioblend order for first time Bioblend customers! As always, feel free to call us with any questions at 617-884-7800, where any of our dedicated Customer Service Reps can answer all your questions. You can also email us anytime at lubeorders@burkeoil.com to ask a question, or place an order. 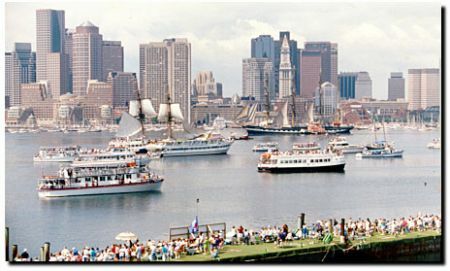 Enjoy these last days of beautiful New England summer weather! BioBlend’s line of biodegradable and biobased lubricants provides ecologically friendly solutions for many of your tough lubricating challenges. BioBlend MPO Biodegradable Multi-Purpose Oil is a readily biodegradable, biobased, multi­purpose lubricant designed for commercial, household, and general lubrication applications. BioBlend MPO meets the guidelines for an H1 product for incidental food contact. BioBlend PO Biodegradable Penetrating Oil is an excellent penetrating oil and general purpose lubricant formulated from readily biodegradable, renewable resource, base stocks and additives. BioBlend PO offers excellent penetrating and loosening of frozen, rusted or stuck components. Dissolves dirt, grease and debris, while leaving a light lubricating film which helps prevent corrosion. BioFlo AW Biodegradable Anti-Wear Hydraulic Fluid is formulated from readily biodegradable, high lubricity base oils coupled with nontoxic anti-wear and anti-corrosion additives. BioFlo AW reduces operating temperatures, friction and component wear in mobile and industrial hydraulics. Excellent thermal and oxidative stability assure superior service life with ­minimal viscosity change over a broad range of operating temperatures. Available in ISO grades 32, 46 and 68. Foodstream BioFlo FG Biodegradable Food Grade is a readily biodegradable, high-pressure, anti-wear, hydraulic fluid for the food processing industry. BioFlo FG meets the guidelines for an H1 product for incidental food contact. Excellent lubricity and temperature stability provide efficient power transfer and superior service life. Available in ISO grades 32 and 46. BioFlo UTF Biodegradable Universal Tractor Fluid is a readily biodegradable, high lubricity fluid, formulated to meet the requirements for Universal Tractor/Transmission Oil (UTTO), drive train, and hydraulic fluid. Reduces operating temperatures and component wear in industrial and mobile hydraulic systems. Provides excellent thermal and oxidative stability with minimal viscosity change. BioGrease DR Biodegradable Drill Rod Grease is the ideal environmentally friendly solution for drill rod applications. Formulated from high purity vegetable oils and thickened with very shear stable lithium soap. Contains the latest in ashless, environmentally friendly, rust and anti-wear technology. Provides rust protection not only while the rod is in service, but also for extended periods while the rod is in storage. BioGrease DR improves water resistance, pumpability, and adhesion to the rod in service while minimizing torque. BioGrease HD Biodegradable Heavy Duty Grease is a readily biodegradable, non-toxic Lithium 12-OH Stearate grease that provides high film strength, withstands high temperatures, maintains excellent stability, and extends lubricant life. BioGrease HD features high load-carrying capabilities and anti-wear characteristics with low water washout properties. Designed for heavy-duty use in industrial, mobile, and marine applications. Available in NLGI grades 1 and 2. BioLube RD Biodegradable Heavy Duty Rock Drill Fluid is readily biodegradable, heavy duty drill lubricant for pneumatic tools, down-hole and surface drilling equipment. Natural polarity and tackiness additive allows the lubricant to adhere to tooling surfaces, reducing corrosion and wear in the presence of compressed air. Wear reduction greatly reduces premature bit shanking and lowers operating costs. 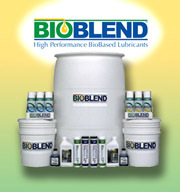 Did you know we stock BioBlend lubricants? Environmentally friendly lubricants for the environmentally friendly contractor. 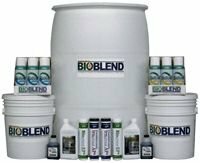 BioBlend is all about vegetable based, readily biodegradeable fluids. These products are ideal for golf courses, marinas, trash companies, and contractors working near water. Call now and get 5% off your first BioBlend order! Just mention Lube Updates when you order! Hey Mr Marina - Why the Name Brand? From talking to many marinas this week I was floored on how much an OEM is charging for 2-cycle outboard engine oil. Its insane!!! What buyers do not understand is that as long as the brand of oil meets that engine's requirements (it is usually a TCW-3), it should work. We carry a great 2-cycle oil that meets the requirements of honda, mercury, evinrude and much more.